The idea of love remains as mysterious and obscure today as it always has been. Owing perhaps to its many forms and manifestations, love defies a definitive description. The only thing certain about it is its glorious uncertainties. American poet and writer Sylvia Plath celebrated love’s uncertainties in her lone novel The Bell Jar as her protagonist looks at the person she could possibly fall in love with. “That’s one of the reasons I never wanted to get married. The last thing I wanted was infinite security and to be the place an arrow shoots off from. I wanted change and excitement and to shoot off in all directions myself, like the coloured arrows from a Fourth of July rocket,” she wrote. To seek ceaseless change is not specific to lovers though. It is one of our most human characteristics. Even when we strive to maintain order around us and discipline ourselves to the extent of regimenting our day-to-day lives, we still feel a subliminal attraction towards chaos and madness — as is manifest in ideas of monotony, routine and boredom. When there is nothing left to explore, that is when the serpent starts to eat its own tail in the hope of finding something new and exciting. Contrary to this is the idea of repetition – a cyclical continuity – often found in mystic love. It suggests that there is nothing finite about love, especially one that is of a spiritual nature. That is perhaps the reason why repetition forms the core of many mystic rituals such as chants, prayers and worship practices. 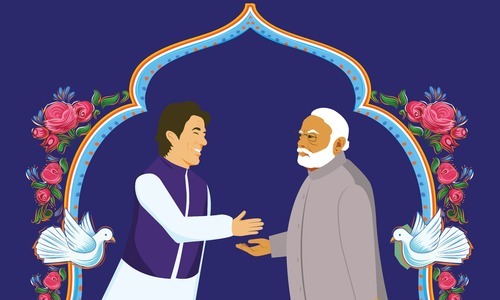 The idea behind the repetitive motion linked to these rituals is to internalise their essence as a means of attaining a state of ecstasy that leads to wisdom and redemption. By doing the same thing over and over again, the mystics, indeed, aim to break away from the routine, the mundane and the orderly. Like those in love, they are in search of the “change and excitement” that helps them “shoot off in all directions”. Creative processes offer similar possibilities of freedom from routine and order through the very act of repeating some mundane activities — such as moving a paintbrush across the canvas, striking a stone with hammer and chisel to carve out a statue, beating and moulding a piece of metal to create a sculpture. By continuously repeating the same gestures and strokes, an artist aims to create something new. Repetition sometimes is so important to the artistic process that failure to maintain a certain rhythm and pattern of repetitive movements may have a serious impact on the nature and quality of the work produced. 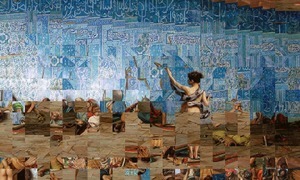 In Amin Gulgee’s work, repetition comes out as a simultaneous manifestation of love, spirituality and creative genius. His latest work, displayed at his eponymous gallery, has taken metallic materials and turned them into sculptures, installations and calligraphy through countless repetitive strokes of his tools. These works mainly consist of beautifully crafted Arabic huroof (alphabets or letters), created with such detail that they automatically attract attention. These letters are shown to be breaking away from scriptures, textbooks and other contexts — becoming free-flowing forms that assume identities of their own. Alluding to the spiritual in a fantastical and striking manner, they seem to be levitating as if in ecstasy. And yet they are connected to, and intertwined with, other parts of the works in an almost musical fashion. Independent curator Zarmeene Shah has drawn some interesting parallels between spirituality and the yearning for discovery in an essay, Into Seven, that works as a sort of preface to the show. “There is a different … movement of space [here],” she states. This movement is “somehow mystical [and] spiritual in its evocations” and “is also present in the recurring reiteration” that the artist has engaged in while creating these works. This reiteration, Zarmeene concludes, is a “search for the one through the many”. Like many of Gulgee’s previous shows, this exhibition was more of an experience than only a presentation of artwork. One was welcomed by an interactive performance, Declaration of Love, as one entered the gallery. Dark-hued glass bottles were arranged in a line on a table along with pieces of paper and pens. The visitors were expected to write a secret confession/declaration of love and insert it into one of the bottles. Gulgee was to destroy all the bottles later by burning them to ashes — alluding to the mystic love that burns inside and consumes the lover before the message of love can even reach the beloved. This experience was echoed inside the gallery where a larger-than-life assemblage – an installation consisting of a carpet made from charcoal pieces – was littered with Arabic letters cast in copper. Spread about randomly, some of the letters were almost concealed under the charcoal. 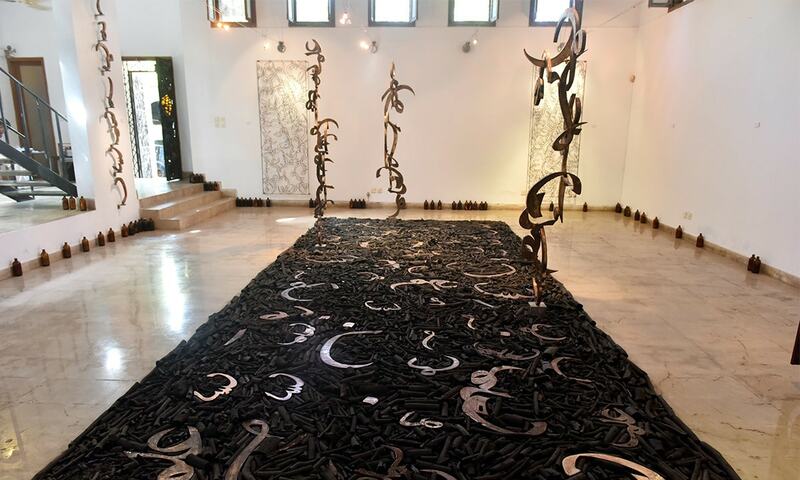 A few calligraphic sculptures were placed on the carpet in an orderly fashion. Their bases were very small, but they could balance by virtue of their composition and crafty welding. One could also see beautiful copper screens made of letters, except they were created like drawings. The perforated letters cast a calligraphic shadow on the wall behind them, making the screens look translucent, like a spirit, visible and invisible at the same time. Gulgee created the same effect with another screen, built as a vertical solid copper rectangle. Letters cut out of it had left behind negative spaces, turning it into a see-through sculpture. The show also featured an engaging video work. Projected on one of the gallery walls, it featured an evocative soundtrack played on a rebab and showed Arabic letters in black appearing on a white background in such a way that the whole background eventually became black, and white letters started appearing on it — until the background became white and the letters black again. This cyclical repetition was perhaps meant to explore the mystic notion of the oneness of the human experience, of our internal darkness and illumination originating from the same source. The exhibition was not just a sensory but also a spiritual experience that nourished ideas of love and devotion by establishing connections between beauty, secrecy, pleasure and mysticism through fantastical manipulations of the calligraphic forms. The work on display not just amused the viewer, but also pushed the boundaries of calligraphy itself, transforming it into a mystical exercise that aims to attain ecstasy in more ways than one. 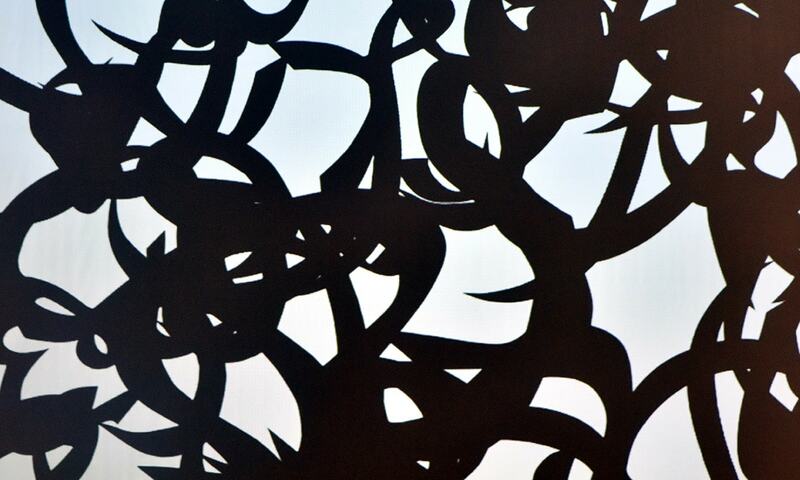 Calligraphy as an art form has mostly remained limited to paper and scrolls but Gulgee has successfully transported it into three-dimensional sculptures and even added a fourth dimension through the video work. These changes inspire both fascination and awe. This was originally published in the May 2018 issue of the Herald. To read more subscribe to the Herald in print.